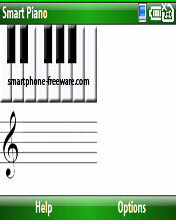 Smart Piano freeware for smartphone, Windows mobile phone free downloads. Smart Piano is a (hopefully) fun app for Windows Smartphone 2003. Press a key and it will make a piano sound, it's that easy. You'll need 1.7Mb free on your phone or storage card. Pressing and holding a key will keep the on-screen notation displayed. There is a one octave range and on screen notation. I believe it will take up a fair bit of memory and there is a small bug: the very first keypress after the app loads doesn't display the notation, but it's all fine after that (I'll get round to sorting that after I've looked into the feasibility of doing some sort of MIDI player). Everything else seems to work on my phone but, as always, use at your own risk. My wife and i ended up being so contented when Louis mgaenad to finish off his inquiry from the ideas he came across through your web page. It is now and again perplexing to just find yourself giving for free methods which often other folks have been selling. And we also take into account we have you to give thanks to because of that. All of the illustrations you have made, the simple site menu, the relationships you will help engender it's all powerful, and it's really assisting our son in addition to our family do think that article is awesome, which is certainly very indispensable. Thanks for the whole lot!